The Summer Olympics are nearly here and my favorite events are the swimming events: freestyle, backstroke, breaststroke, butterfly and the individual medley, a combination of all four. 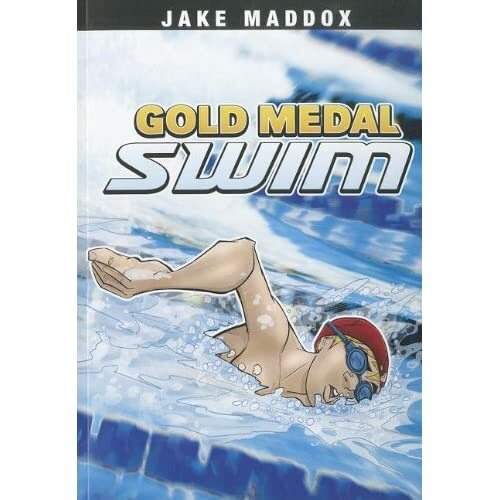 Gold Medal Swim from the Jake Maddox sports series is a fictional account of competitive swimmers preparing for a freestyle competition. From the illustrations, it appears to be geared for the high school crowd although it is aimed for a younger audience. "For the next two hours, Sam helped Julien practice swimming laps. He showed Julien how to be sure to roll his whole body with each stroke." Body roll is very important in freestyle. The crawl is another name for this stroke. I share an interest with Katniss Everdeen, the plucky heroine of the Hunger Games trilogy by Suzanne Collins. We both like swimming. Katniss was taught to swim by her father. I learned at summer camp. Like Katniss, I have felt the muddy bottom of a lake between my toes. When I go to my pool this summer I will do what I call "The Katniss workout." This one is backstroke only. Using my swimming fins I will do a round of backstroke kicks. Using my pull buoy, I will work only my arms. Doing the complete stroke will finish things. Join Katniss and me this summer! For tips, view this video.